Providing vital medication information for patients and caregivers. With Drug Notes and the Drug Interaction Checker, you can provide vital medication information for patients and caregivers. Used together, Drug Notes and the Drug Interaction Checker provide important information, such as how to take a medication, what to avoid while taking it, possible side effects, and drug interactions—for more than 2,100 generic and brand name medications. 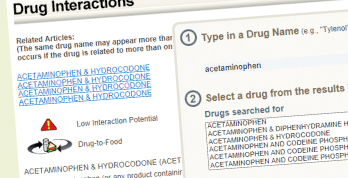 With more than 8,000 unique drug terms, the Drug Interaction Checker allows patients, plan members, or web site visitors to check for interacting drug ingredients, their effects, and their clinical significance.